Richardson (P) - Had an attack of appendicitis when the crew landed in New England and was taken to a hospital for surgery. The crew, without Richardson, was flown to Scotland with an ATC Pilot. They were given 10 days ground school at Molesworth and then awaited the arrival of Lt Richardson. So they could fly as a crew. Emick (N) - Was killed in action on 13 January 1945 mission #301 to Mannheim, Germany in B-17G #42-107099 Old 99 (427BS) GN-W, Capt M.S. McGinnis Pilot. Massingill (E) - Injured his back while flying with another crew. Higgenbotham (WG), Hendrix (R) and Ladd (Tog) - Had been removed from the Richardson crew after ground school training and were turned into radar counter-measure operators. (*) Crew Incident: On 15 March 1945 mission #337 to Zossen, Germany in B-17G #43-39220 Smilie Jack (aka Shillelagh) (427BS) GN-G. Lt Richardson, calling the formation leader on VHF, reported that he was going to abort, had one engine feathered and was heading for the lines. He did not specify which lines, but it was believed he meant the western front lines. A wheels-up landing was made at the Okecie airfield near Warsaw, Poland. All crewmen were unhurt. 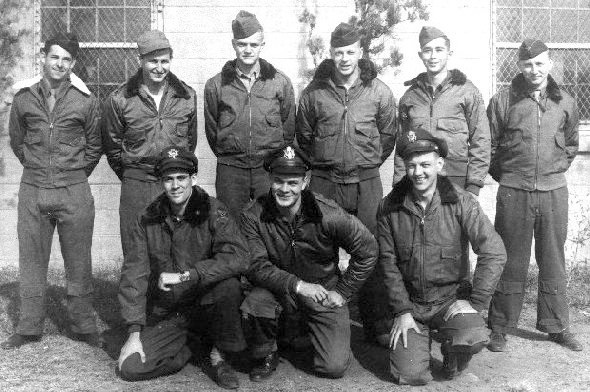 Replacement crewmen on mission and crash landing: F/O William R. Rubins (N) [See 427th Julius C. Demian Crew photo] for 2Lt Emick (N); 2Lt John E. Pacheco (B) for Sgt John Ladd (Tog); S/Sgt Henry E. Lindeman (E) (From 427th BS Lt Donald C. Aagesen Crew) for Sgt Massingill (E); S/Sgt Howard A. Grossman (R) [See 427th P.D. Eisenwinter Crew photo] for Sgt Hendrix (R). Sgt Higgenbotham (WG) was not on the eight man crew - The waist gunner position had been deleted from the crew.